As much as I love that products have been tailored to every whim and catering for my every beauty need, I often look to natural products to treat any beauty ailments. I’ve dabbled around different oils and herbs and gels, and love making my own DIY masks so I’ve compiled a list of my favourite natural products that I think everyone could benefit from. Coconut oil: What is there not to love!? Scientifically speaking, coconut oil is full of anti-oxidants, so can help to reverse sun damage and aging skin. It also has straight chain molecules so can be more easily absorbed into your hair and skin than other oils (or something like that, it’s been a while since I looked it up as I’ve been hooked for so long). Speaking from my own heart, it is just the best moisturiser/ intensive conditioner/ eyelash growth serum/ rash reducing oil that ever existed. I seriously use it on everything. I swear by coconut oil being the reason I have quite long lashes: when I slip up putting it on at night for a while they seem a lot sparser than when I apply it regularly. Likewise, I used coconut oil on my eyebrows when I decided the overplucking I did as a young teen was an embarrassing look to have and I have mega thick brows nowadays. When my hair was bleached and straw like, I would put coconut oil in the ends of my hair daily and my poor hair would lap it all up and look slightly less dry, plus I’d do intensive overnight oil treatments before showering it off in the morning and within about a month my hair had stopped breaking off at every touch, and within a few months it was actually in a healthy condition. NO WORD OF A LIE. I’ve also used it to make DIY lip scrubs before and it worked beautifully. Coconut oil is solid at room temperature, which can make applying it a nuisance, so I keep mine on the radiator and it tends to stay melted. I buy my coconut oil from Dolphin Fitness- it’s £7 for a huge tub of unrefined coconut oil, whereas it’s like £14 from Holland & Barretts. A little goes a long way as well. I stocked up when I went to India over summer, as I could get the same amount for 150 rupees (£1.50!). Bargain. Almond oil: my second favourite oil. I find almond oil is absorbed more easily into my skin than coconut oil. It also has a really lovely, sweet and nutty smell. Scrumptious. I bought a small, calpol shape and sized bottle for about £2 from Home Bargains a while ago, not too sure where to get larger stock, as I got a massive bottle for 80p when I was in India. 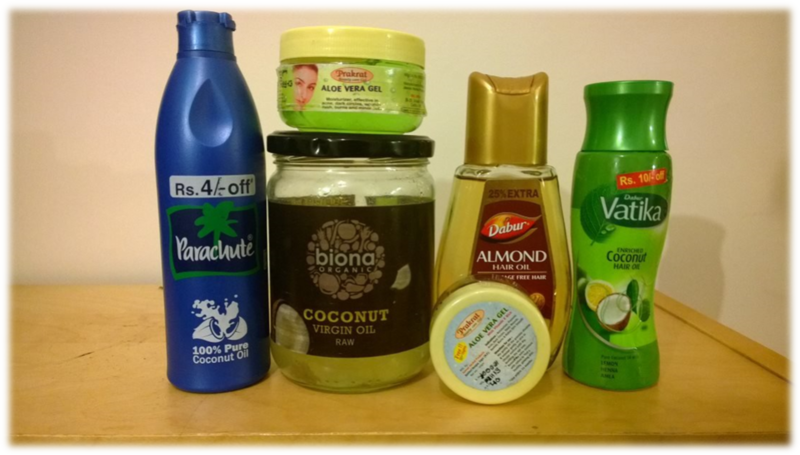 Love India for natural products! Aloe vera gel: I got this for the first time in (yep, you guessed it) India. I’d wanted to try it for a while but never looked into it. A Nivea crème sized tub set me back 70p. It works amazingly as a moisturiser, and seriously soothes your skin: it’s good for calming down any red, inflamed skin, be it spots, burns, sunburn, rashes… You name it, aloe vera fixes it. I also find it really soothes my under eye bags after a long day. Ideally, I would buy my own aloe vera plant but I haven’t got round to it. Plus I am completely incapable of keeping plants alive. Like seriously. Eggs: Not your average beauty treatment! They are basically pure protein, so are great for strengthening your hair and smoothing your skin. I always mix with olive oil if doing a hair treatment, as it can make your hair feel a bit stiff (for lack of a better word), so the oil adds in a bit of softness. Just make sure you rinse it with cold water before washing, or you’ll have scrambled eggs in your hair! Honey: Absolute life saver for dry lips (if you can resist licking it off). It has antibacterial properties so it’s good for popping into a DIY face mask to try and kill any spot causing bacteria. So these are my top 5 natural beauty life savers. You can tell how much I love coconut oil, right? I made all 12 volunteers in India buy some, and they were so impressed they bought more while we were out there. I use it slightly less than I used to, as it faces competition from other lotions and potions, but I will always have a special place in my cupboard for it. I think it’s nice to take a break from man-made products, as you can’t be sure what ingredients they have in. Plus, it’s a lot cheaper! And I love coming across or creating new recipes to try out on my face and hair. I have to totally agree.. coconut oil is AMAZING!! I mostly use it with cooking and mix it with Manuka honey&Coconut Milk as a treat to eat. I am definitely going to try and put it on my eyelashes, who knew it had so many uses! I’ve never actually used it for cooking, but I do want to try it! Yeah put it on the ends before bed and in a few weeks you’ll notice that they are looking longer and more lush. Just be careful not to get it in your eyes, it doesn’t hurt or anything but it makes your vision go blurry! Natural is the way to go! Isn’t coconut oil fabulous? I even use it as a shaving cream!! And almond oil is deliciously wonderful. Thank you for this great post!